This sheet of paper is 8 1/2" x 14" and is dark orange. It is the last page of a packet of documents held together with two large brads and appears to be the "cover" page. At some point in the past the pages were probably folded in half and this was on the outside. The stain in the lower right corner looks as though it might be from grease. 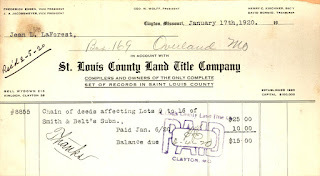 The page is labeled as coming from the St. Louis County Land Title Company. 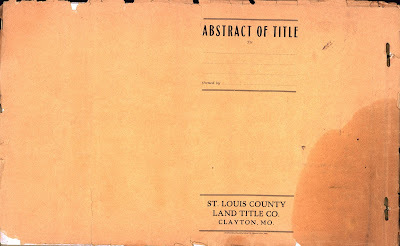 The title on the page, "Abstract of Title", describes reasonably well the contents of the packet. This half sheet measures 8 1/4" x 4 1/2". 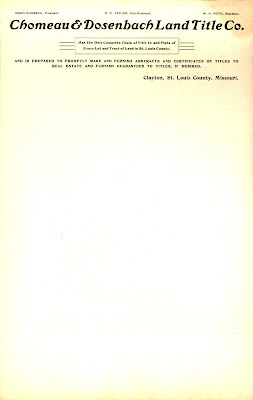 It is the last page in the set of documents, appearing just before the above file "cover." 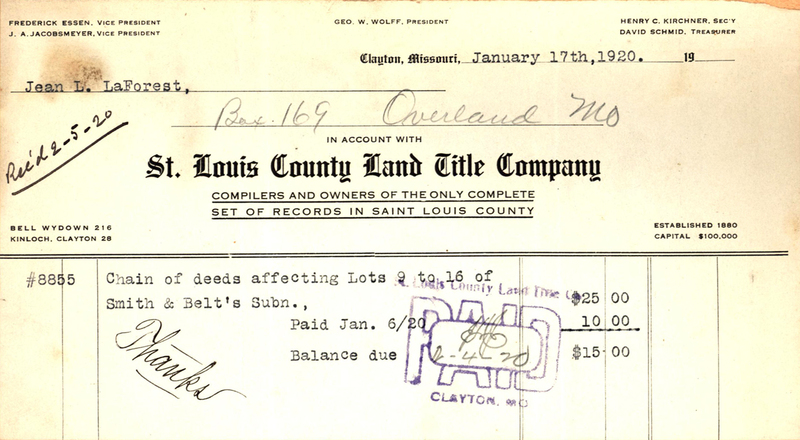 It is a receipt from the St. Louis County Land Title Company, addressed to Jean L. "LaForest" of Overland, Missouri and shows an order for the chain of deeds for lots 9 through 16 in Belt's Subdivision. The dates on it appear to indicate that Jean placed his order on January 6, 1920 and paid $10, probably a deposit against the total copying to be done. He might have mailed his order, because the top of the receipt is dated January 17, 1920; it's also possible that it simply took a week for a clerk to register the request as #8855 with a charge of $25. When the job was finished, the balance due was $15, although no date is entered for that. The "PAID" stamp shows the bill was paid off February 4, 1920, and Jean's note in the upper left records that he received the documents the next day, on February 5. This sheet also measures 8 1/2" x 14". 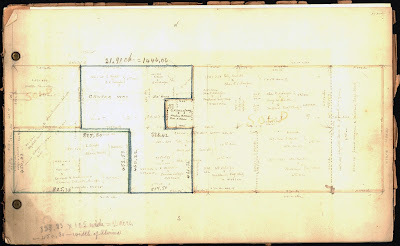 The hand-drawn map was attached to the front of the complete packet from the title company. 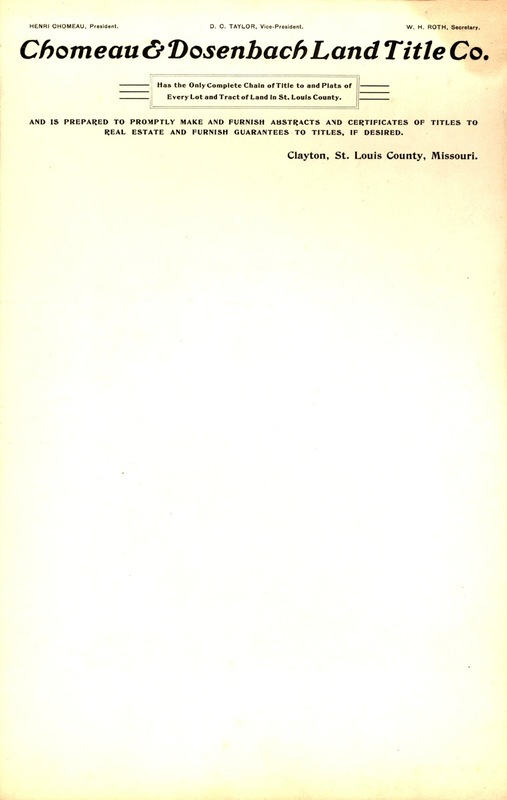 The blank page (from a different land title company) is the reverse side of the map. Judging by the handwriting on the map, I suspect that Jean La Forêt is the person who created it. 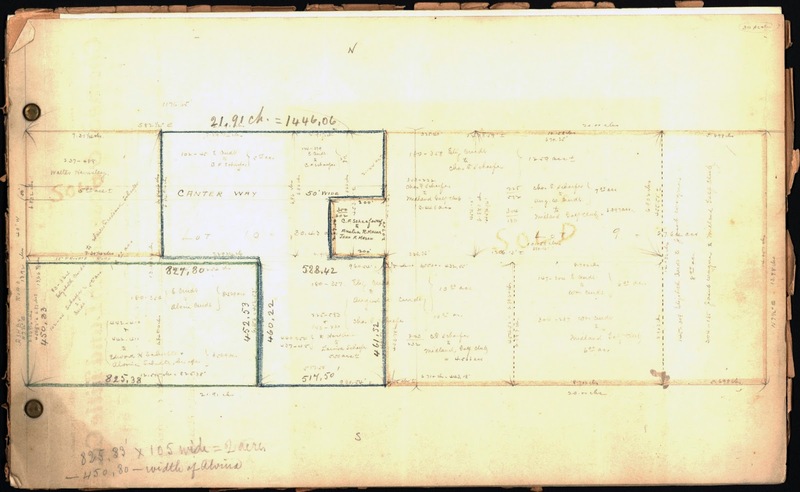 The large packet of papers between these sheets consists of abstracts of land transactions for the lots mentioned on the receipt. 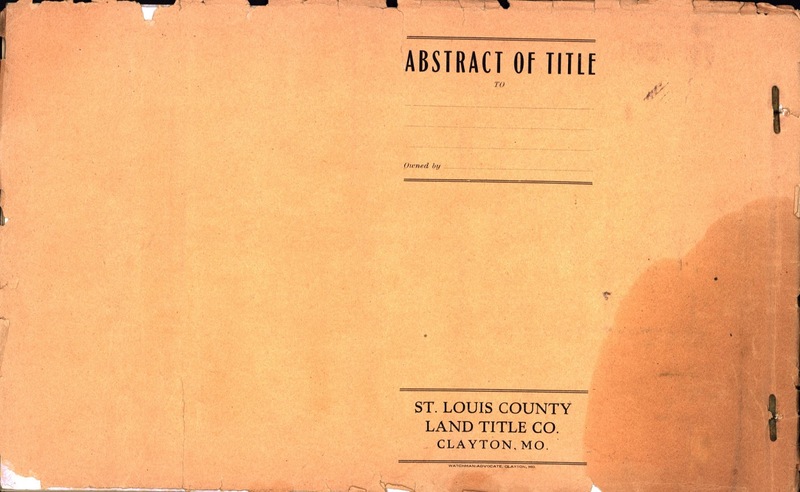 These abstracts appear to be the source of the information that Jean used to reconstruct the history of the sales of the land purchased by John Schafer, lots 9 and 10, the focus of the dispute between Emma (Schafer) La Forêt and her three Curdt siblings. So Jean didn't go to the county recorder or assessor and research all this himself; he ordered copies and let the county office do the research for him. Then he pulled out the information relevant to his search and apparently retyped all of it. There are more than 20 pages in the packet, so I will be posting only a few each week. I find it interesting that Jean's last name was misspelled "LaForest" on the receipt. As a French language major, I learned that a word containing a vowel with a circonflexe (circumflex in English) over it often appears in English with an "s" after the vowel. So, for example, the word "forêt" translates as "forest." I doubt that the clerk in Missouri in 1920 knew this, and yet Jean's last name became Forest. Just how did that happen?